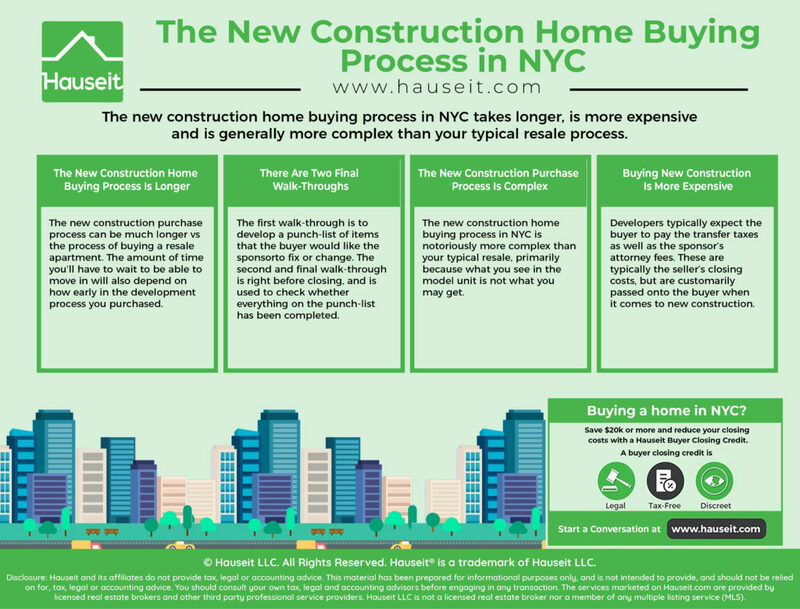 The new construction home buying process in NYC takes longer, is more expensive and is generally more complex than your typical re-sale process. Buyers will have to pay special attention to the offering plan as the final arbiter of what their finished apartment will look like. We’ll overview the new construction home buying process in NYC in the following article. The new construction home buying process can be much longer vs the process of buying a re-sale apartment. While a re-sale is typically ready for immediate move-in, a new construction project may have months or years left in its construction schedule. Furthermore, unexpected delays are a frequent occurrence in new construction projects, and an anticipated completion date is often no more than a best guess by the developers. The amount of time you’ll have to wait to be able to move in will also depend on how early in the development process you purchased. While there are often juicy discounts for pre-sales which are often initial orders to help the sponsor secure construction financing, you’ll often have to wait the entire construction period which can take years. There is less waiting involved if you come in towards the end of the construction process when units are largely finished or closings have already started. 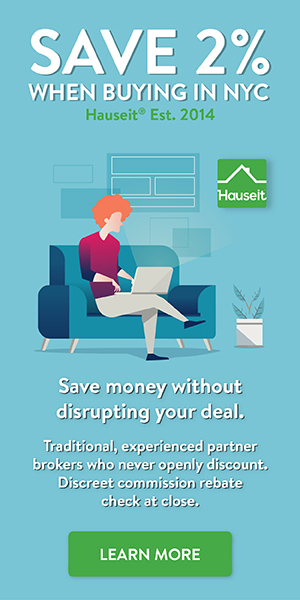 However, because there is less risk with a nearly finished project you won’t get the same deals or discounts as a pre-sale buyer. Pro Tip: Being the first purchaser in a new construction building can be risky as the sponsor will need to have at least 15% of the total units in contract before the condominium declaration can be declared effective. This means if the sponsor never finds enough buyers to meet the 15% threshold, the project will never close and your contract may be cancelled. If you’re lucky enough to be able to inspect your nearly finished apartment, then it’s important to understand a quirk unique to the new construction home buying process. In new construction, there are typically two final walk-throughs vs just one in a typical re-sale process. The first walk-through is to develop a punch-list of items that the buyer would like the sponsor to fix or change. The listing agent or a sponsor’s representative must be present when the punch-list is developed, and any requested changes must be reasonable in nature and mutually agreed upon. The second and final walk-through is right before closing, and is used to check whether everything on the punch-list has been completed. If any items are incomplete, the sponsor will simply make a good faith effort to complete the remaining items post-closing within a reasonable amount of time. Pro Tip: Remember that there isn’t a timeline to complete your punch-list post-closing. The sponsor only needs to make commercially reasonable efforts to complete the buyer’s punch list. This is why it’s important to thoroughly diligence the developer’s reputation and brand before buying from them. The bigger, more established developers have a lot of brand equity to protect and will typically do a good job of finishing punch lists to buyers’ satisfaction. 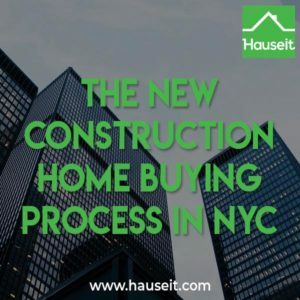 The new construction home buying process in NYC is notoriously more complex than your typical re-sale, primarily because what you see is not what you may get. For example, there may be major differences between the model unit that you see vs your actual unit when construction is complete. That’s why it’s super important for buyers and their attorneys to thoroughly diligence the condo or co-op offering plan because it determines what will and what won’t be included in your finished unit. Furthermore, buyers should be vigilant about how the developers measure square feet in the offering plan. Many sponsors will exaggerate the square footage by including wall space and common areas. Additionally, buyers should take a look at the proposed budget to check if the advertised monthly common charges are artificially low. Often times, sponsors will be too optimistic in the expected costs of running a building, and may not even factor in a salary for a superintendent because the owners might be happy with managing janitorial services themselves. Pro Tip: Read our overview of the special risks to buying a new construction home in NYC before you submit an offer. Make sure you’re working with an experienced buyer’s agent and an attorney who specializes in real estate transactions. Buying new construction is more expensive for a couple of major reasons. The first is because new construction condos and co-ops in the city are designed and marketed for the luxury and ultra-luxury segments of the market. This means you will usually find top of the line appliances, materials and finishes in a new construction apartment. However, you can pay twice as much or more than your typical re-sale apartment for the privilege. For example, let’s say a resale apartment is going for $1,000 price per square foot (PPSF). A comparably sized new construction condo might trade for at least $2,000 PPSF. Larger, ultra-luxury units with high floors and water or park views might trade for 5,000 or 6,000 PPSF and more! 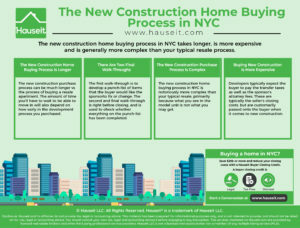 The new construction home buying process in NYC is also more expensive because of closing costs and taxes. That’s because developers typically expect the buyer to pay the transfer taxes as well as the sponsor’s attorney fees. These are typically the seller’s closing costs, but are customarily passed onto the buyer. Fortunately, with the assistance of a great buyer’s agent, you can negotiate on closing costs as easily as you can negotiate on price. In an oversupplied and soft market, developers have been known to not only cover their own closing costs, but to also offer to cover some of the buyer’s traditional closing costs such as the Mansion Tax in NYC. Pro Tip: Be careful about paying the sponsor’s NYC transfer taxes if you are purchasing multiple units in a new development. That’s because you could end up being responsible for NYC transfer taxes at the higher commercial or “bulk” rate of 2.625% vs the traditional re-sale rate of 1.425%. This is in addition to NY State’s transfer tax of 0.4% of the sale price. What Is the Typical Co-op Pet Policy in NYC?